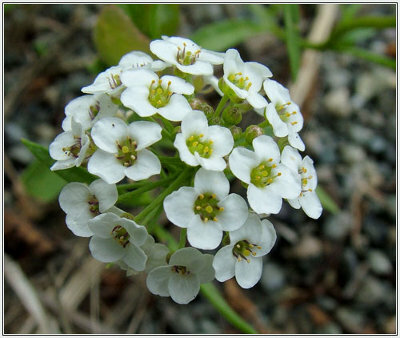 Facts about Alyssum Flower (Plant), "Scientific name for Alyssum Flower (Plant) is Obularia maritima". The Sweet Alyssum Flower (Plant) is also known as the sweet Alison. The Alyssum Flower (Plant) comes from the genus Alyssum which is categorized as a species of flowering plants with low-growth. The Alyssum Flower (Plant) is usually a carpet of small flowers which have a sweet fragrant and are delicate. The Alyssum Flower (Plant) is usually covered with flowers through out the year. The annual plant grows to a maximum height of about two to twelve inches (5 to 30.5 cm) with a spread of eight to twelve inches (20.3 to 30.5 cm). The Alyssum Flower (Plant) has several branching with numerous clusters of tiny blossoms. The Alyssum Flower (Plant) has its leaves developing to a length of about one to four millimeters and three to five millimeters wide. The leaves are arranged alternatively, sessile, broad and have an oval to lanceolate in shape. The margins of the leaves are entire and remain quiet hairy. The Alyssum Flower (Plant) has its flowers growing up to five millimetres wide, have four sepals, four rounded petals which are white in color and sometimes appear violet, lilac, rose red and pink and produces sweet scent. The Alyssum Flowers have their sixth stamens consisting of yellow anthers. The Alyssum Flowers are produced throughout the entire life of the plant. However, their sprouting can be hindered by the development of frosts. The plants fruits are oval- shaped seedpods which are numerous, hairy and contain seeds. The Alyssum Flower (Plant) can do well in calcareous soils including soils found in waste grounds, cultivated fields, slopes and sandy beaches. It can tolerate maximum altitudes of about nine hundred and eighty four feet (275 to 245 meters) above sea levels. The Alyssum Flower (Plant) requires partial shade to full sun and is tolerant to dry weather conditions. If you intend to establish the Alyssum Flower (Plant), then it is important that you grow it in early spring or in winter in frost free areas. For small gardens, the Alyssum Flower (Plant) can be indoors. However, it requires regular exposure to sun in order to keep the soil warm. The Alyssum Flower (Plant) can be grown for ornamental purposes due to its blossoms and fragrance.